Available in standard or swivel models. Safety guards are spiral wire front and rear. 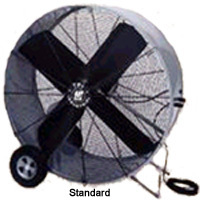 Swivel model rotates 360Â° in 12.5Â° increments and locks in place with a steel locking pin. Powder coat 20 ga. steel housing has front and rear roll formed embossments for added strength and rigidity. Motor is dependable 1-speed, 1 phase, 115V ball bearing open drip proof permanently lubricated permanent split capacitor. Rocker switch. Steel blade. Cord is SJT type 3 conductor, 15'L. Rolls easily on 10" hard rubber wheels. Meets OSHA standards. UL listed. FOB Shipping Point. Product No. Fan Dia. Fan Type CFM High RPM AMPS High Wt. (lbs.) Price Ea.